We caught up with Jordi Brinkman, Nikon Europe’s Product Manager, at Photokina 2018. Digital Camera World Nikon’s first mirrorless cameras are at the higher end of the market. Are there cheaper models in the works? And are there any plans to introduce APS-C models? Jordi Brinkman This is just the start. We had long discussions for a few years about about mirrorless: should we start at the entry level, with a DX sensor, or should it be higher up? We’ve been monitoring the market quite closely, and what we see is the trend for the higher-end, full-frame models. This is really the growing segment. Where we see a shift from DSLRs to mirrorless, it’s specifically the price bands above €2000, so the higher end was where it was obvious that we had to be. DCW Likewise, the first lenses we've seen are top-end – will there be cheaper lenses in the pipeline to suit any future lower-cost mirrorless models? JB The lenses that we’ve presented now, we call them the ’S-line’ lenses. The ’S’ stand for ‘superior’ and they’re basically the premium line and have the best optical performance we can deliver with that kind of spec. Also, the roadmap that we have disclosed – that’s also for the S-line. But having an S-line suggests that there should also be something else; non-S-line lenses, which will focus more on affordability. However, they will still meet a high quality standard while focusing on lower cost, so maybe won’t have weather sealing or they'll use different materials. DCW With the removal of the mirror, the only mechanical component left in the camera body now is the shutter release – but the Z cameras also have a 'silent shutter' option that appears to be purely electronic. Could future models lose the mechanical shutter altogether? What are the technical differences between shutter and shutter-free operation? JB At the moment not. But in the longer term, who knows? There is a mechanical shutter and a silent shutter for a reason. The mechanical shutter is basically better for action photography, for fast-moving action. That’s because the silent shutter is a ‘rolling shutter’ that exposes line-by-line from top to bottom, so there’s a difference in time as each line is read. You could say the mechanical shutter is also line-by-line, but the shutter moves faster, and so that is better for fast-moving subjects. But there is something called a ‘global shutter’, which is a sensor that’s exposed all at once – on and off – but that technology is super-expensive at the moment. So, once the technology becomes affordable and could be incorporated into a camera at an acceptable price point, then there may be a solution to not have a mechanical shutter. The technology is there, but the price isn’t there yet. DCW Could any of the mirrorless tech make its way over to Nikon DSLRs? For example, on-sensor VR, or could a DSLR be developed with the new Z-mount? JB That’s a really good question. Actually, on the DSLR we could have chosen sensor-based VR because that technology exists already, but we chose lens VR because you then have the stable view in the optical viewfinder. We think that, for a DSLR, lens VR is better. However, for mirrorless it’s better to have it on the sensor, as because you have an electronic viewfinder there’s no advantage of having the VR in the lens. With sensor-based VR we now have five-axis stabilization, so the lens design is easier and you have more flexibility. For us there would not be much sense to bring VR into the DSLR body, so that you won’t see! The Z-mount offers the next level of optical performance and that’s because the mount lets in more light in straighter lines with fewer distortions due to the thin flange between the mount and the sensor, so this would not be possible on a DSLR. DCW So why the new mount? Was there a temptation to create an F-mount mirrorless that could make use of Nikon's huge range of lenses natively without adaptors? JB I’ve been involved in many discussions over the years! Yes, mirrorless. But what should it be? What kind of added value can we bring? Should it be the F-mount? But the F-mount has been here for 60 years; it started with film, and I think the team that developed the F-mount would never have believed that we’d be using it for 60 years. For mirrorless, the F-mount has its limitations. It would keep the body too thick, and the point of mirrorless was to get it thinner, so quite quickly we decided no, we had to reset the foundation for the next-generation of image quality. We really decided not to speed up things for mirrorless – the F-mount would have been our quickest solution but it would not have been our best solution. The Z-mount is the best for mirrorless today – but more importantly for the future. DCW Is the in-body VR a compromise in any way – are the results really as good as lens-based stabilisation systems? JB Actually there are only benefits. Now you have five-axis VR, which is better than the standard VR we have on lenses. But also, because you can use the adaptor for F-mount lenses, if you have non-VR F-mount lenses, all of a sudden you can enjoy the technology of VR in the body. So there’s no compromise at all, but as I said, VR is the right choice for the mirrorless – not having sensor-based VR on a mirrorless would be a mistake. DCW So Canon have made a mistake? DCW Why only one card slot – and why the XQD format? JB We’ve seen the comments. But our main priority, with the Z7, is that the huge amount of data that the number of megapixels and 4K video really requires the best possible media, and XQD happens to be the best possible media available. It's the fastest card, and it’s very reliable. And also the concept of mirrorless is to be as compact as possible, so yes, we did consider adding a second card but we decided to prioritize keeping it as compact as we can. Basically, if we had added the second card slot the camera would have been bigger – and we didn’t want that. To the pro photographers we’ve spoken to, it’s not been a big issue. DCW Why the initial lens line-up – a 35mm, 50mm and 24-70mm f/4 – but no ultra-wide or telephoto zoom? Did these lenses just happen to be ready first or was the lineup always planned this way? JB First of all, it takes time. You cannot make 10 lenses all at the same time, it’s just not possible. The 24-70mm f/4 – this is the first time people would buy such a system so an all-round lens makes sense. If we’d had done an f/2.8 lens it would have been too expensive, too big for the start of the concept. So we thought this lens offers portability and a good price. And then the 35mm and 50mm lenses, we thought these are classic lenses that make sense to start with. And we are showing our plans for the next two years, so you can see our commitment. And actually, right from the start, with the adaptor you have over 360 lenses to chose from, so I think it’s quite a mature system already! DCW We're heard a lot about the forthcoming 58mm f/0.95 lens – what will be the advantage of this lens, and will other super-wide-aperture lenses be available? JB That lens really shows the capability of the system. What you can expect from this lens is a level of bokeh that has never been seen before. It was our intention to offer the next level of image quality and to really present the feeling that you would have with your own eye; it’s trying to get as close to what the eye would see. And as you can see on our roadmap, there is also a 50mm f/1.2 lens. Because of the new mount, actually you cannot make an apple-with-apple comparison of an f/1.8 lens with this system with an f/1.8 lens for a DSLR, because the f/1.8 from thew Z mount is more similar to the kind of image quality you’d get from an f/1.4 on a DSLR. So that’s really never-seen-before image quality. DCW What do you think you will sell the most of: Z7s or Z6s? What we can see now is that the back orders for the Z7 are higher – maybe 60% to 40% for the Z6. On average, I think it will be 50/50. In the first half-year I would expect the Z7 to sell a bit more, and then the Z6 more after one year. 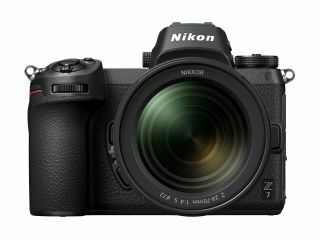 DCW Why did it take Nikon so long to release a full-frame mirrorless compared to some of your competitors? JB We didn’t want to rush it. We didn’t want to follow the crowd. The quick-and-dirty solution would have been an F-mount mirrorless, but that would not have made sense to us. At Nikon we took a few steps back: why mirrorless? What are the benefits? It took us time to get that thinking right, so the conclusion of all this thinking is to bring the benefit of mirrorless and the DSLR together to have the best of both worlds. But that was not good enough; there’s already that technology out there in one system or another, so on top we wanted to bring the next level of image quality to push us into the next 100 years, that’s really been the concept, and you don’t decide that in the short term. DCW With DSLRs it’s been pretty much a two-horse race with yourselves and Canon. Now, with mirrorless, the playing field is a lot bigger. How do see the the announcements of your competitors at Photokina influencing your plans with the Z system? JB It’s going to be a really interesting time for us. It’s going to be good for the photographers. We are really showing innovation and I think competition is good. It shows we’re all thinking in the right direction. I think we can expect Nikon users to feel at home with the Z system because the menu system is the same, while if you’re new to mirrorless systems you have the luxury of choice. But we have a really well-thought-through concept that offers the next generation of image quality. The concept sits really in the mount. Specifications could be kind of similar between systems, but whenever you see a specification, it’s just a specification; from the photographers and people who’ve had the chance to actually use the camera, it’s really about touching it and using it, and that’s something you cannot express on paper. Go to your local store and try it!